Crews pour concrete for a new sidewalk along the south side of 75th St., then ensure a smooth finish and 1.2 percent slope. Sidewalk Nearly Complete Along 75th St. 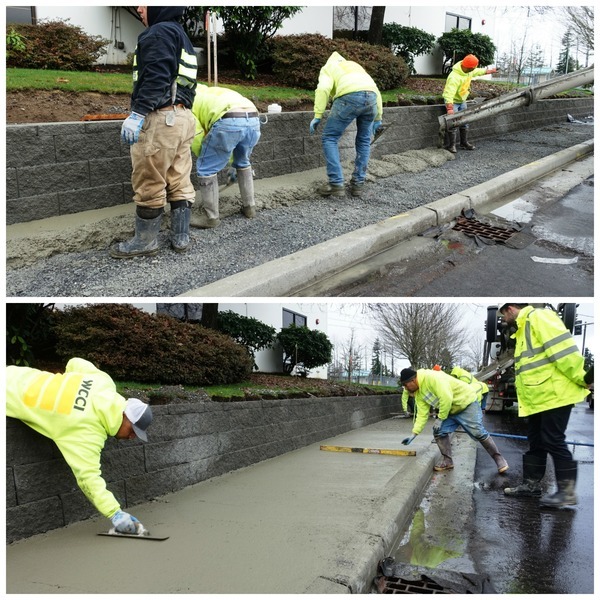 Concrete crews took advantage of dry weather earlier this week to complete a sidewalk on the south side of 75th St. from Alpine Cleaning & Restoration to the Everett Transit bus stop. After pouring and smoothing the concrete, care was taken to ensure a consistent 1.2 percent slope — just enough to allow water to run off of the sidewalk, but not enough to hinder strollers or mobility devices. The final section of the sidewalk, from the Everett Transit bus stop to Seaway Blvd., will be completed in the spring. Installation of traffic poles on the north side of 75th St. Begin framing of building on the main site that will house mechanical functions of the transit center. Traffic on 75th St. will continue to be reduced to one lane in each direction as needed. This pattern of lane closure is expected to continue for several more weeks. Seaway Blvd. is not scheduled for any lane closures at this time. Information about the Seaway Transit Center is online at www.communitytransit.org/seaway. Crews have begun to work in Area 2 of the Swift Green Line construction plan as they approach completion of the first stage of work in Area 1. Southbound Airport Rd. and Kasch Park Rd. Eastbound Airport Rd. and Gibson Rd. Work will continue moving east and south down the Swift Green Line corridor in stages, resulting in each station being visited several times throughout 2018. Information about the Swift Green Line stations is online at www.communitytransit.org/swiftstations. Next week, crews will begin grading the site on the northwest corner of 128th St. SE and 3rd Ave. SE to prepare for a concrete curb, gutter and sidewalk. The eastern driveway to Quality Inn & Suites will remain closed for another 2-3 weeks. Wet weather has delayed landscaping along the new sidewalk on the south side of 128th St. Landscaping will take place when the soil is dry enough for planting. New traffic poles and lane signage are scheduled to be installed in the next 4-6 weeks. Information about the 128th Street project is online at www.communitytransit.org/128th. The February Community Transit Live webcast on Swift construction is scheduled for Noon on Feb. 22. The agency’s Communications and Planning staff will present the latest construction updates and plans for the future, as well as take questions from viewers in real time. It will be the first time that the monthly 30-minute webcast is held during the day. The hope is that this time may work better for those who are unavailable to tune in during the evening. View previous Community Transit Live webcasts at www.communitytransit.org/ctlive. 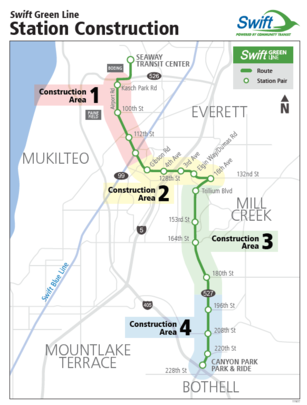 The Swift Green Line will run between the Canyon Park Park & Ride in Bothell and the Seaway Transit Center, which is currently under construction near the Boeing Everett plant. Swift Green Line buses will serve 34 stations at 16 intersections and two terminals every 10 minutes weekdays, and every 20 minutes nights and weekends. Community Transit is building the stations in stages: underground utility work, concrete platforms, and finally the station structures. Construction began in Area 1, the northernmost part of the route, and will generally move east and south, resulting in each station being visited several times in 2018. Swift stations will provide weather protection, seating, adequate lighting, real-time next bus signs, and a rider information kiosk. ORCA smart card readers and ticket vending machines will provide quick and easy ways for riders to pay their fare before boarding a Swift bus. The Swift Green Line will connect with the Swift Blue Line at Hwy 99 & Airport Rd., establishing Snohomish County’s first high-capacity transit network. The network will eventually include more Swift lines and Link light rail. The Swift Green Line will begin service in spring 2019. © 2018 Swift Network News is published weekly by Community Transit.